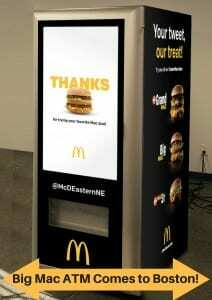 Big Mac ATM Arrives in Boston with FREE Big Macs! 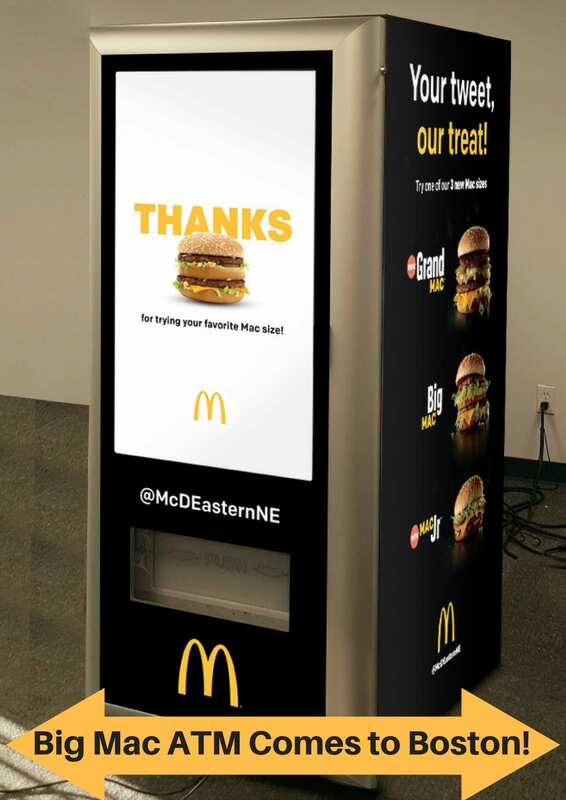 McDonald’s of Eastern New England is celebrating the launch of two new Big Mac sizes on Tuesday, January 31, 2017 with a digital Big Mac ATM! The Big Mac ATM is giving guests the opportunity to enjoy a FREE big mac of the size of their appetite– a McDonald’s Mac Jr., Big Mac, or Grand Mac, while supplies last. The Big Mac ATM will be available on Tuesday, 1/31/17 from 11 a.m. to 2 p.m. at McDonald’s Kenmore Square location at 540 Commonwealth Ave in Boston. McDonald’s team members will also be at the Huntington Bridge (connects the Pru and Copley Mall) handing out coupons for free macs for anyone that cannot make it to the new location. For more information about the Big Mac ATM, please head here. Will you be visiting the Big Mac ATM for a free burger?